Philadelphia 76ers guard Jimmy Butler (23) reacts to his dunk alongside guard Ben Simmons (25) and guard JJ Redick (17) during the fourth quarter against the Utah Jazz at Wells Fargo Center. You might have never guessed they'd reach this point while watching the Sixers coast to a 21-6 lead to open the game, but by the time the fourth quarter rolled around, they were in trouble. Donovan Mitchell was finding a rhythm, Joel Embiid was struggling to get it going against Rudy Gobert, and the Jazz were looking like they might just finish off the Sixers. It was not Embiid who came to the rescue, it was not their shooters, it was Jimmy Butler, the guy who they brought here to do exactly what he went out and did in his home debut on Friday night. After earning free-throws on a cut the play before, Butler scooped up the leftovers from an Embiid defensive play and prepared to go to work on the other end. Jimmy G. Buckets, the G. stands for Gets. I can remember sitting in my seat on press row at Wells Fargo Center and thinking to myself, "The Sixers never have the guy who hits a three in that spot." They've squandered all sorts of leads over the years, in part because they've never really had that perimeter player who can go out and stop the bleeding. Butler is that guy. "That's a fantastic debut for him," said Brown. "He was our bell ringer tonight, and just really validates the excitement we have getting him in the program." And to hear Butler tell it, it wasn't exactly a complicated process to get him into that attacking mindset. "Coach Brown called me last night, like, 'Hey, I remember one time you were in this building and you scored 50,' and he was like, 'Do that.' I was like, 'OK. '", said Butler. "Then when we got in the little walkthrough this morning, he was like, 'You remember what I told you?' I go, 'Yep.' 'Do that.' And I was like, 'OK.'" The questions surrounding Butler have never really been about the short-term, so no one should be making any rulings based on his 28-point debut at home. But across 48 minutes, Butler showed his new crowd exactly what the Sixers were hoping to get when they swung this deal for a star. In theory, the reason the Sixers drafted Markelle Fultz was to take advantage of the confidence (and proficiency) he showed as a scorer at all three levels in college, which would help work around the wonky skill set of their other No. 1 pick, Ben Simmons. With Butler on the floor for Philadelphia, there's no more theory needed — they have exactly what they were looking for. The Simmons half of the equation is a puzzle that still needs to be solved, but Butler already looks right at home running dribble handoffs and pick-and-rolls with his new running mates. The former play is a staple of Philadelphia's offense, and Butler has looked at home whether he's shooting directly off the handoff or turning the corner and pulling off his own dribble. That dimension has simply not existed for Philadelphia during Brett Brown's tenure. They've had to sacrifice either shooting or the ability to handle the ball in most of their handoffs, limiting the pressure it puts on opposing defenses. With Butler in the fold, they can distort the court to their advantage without having to change a whole lot about their offense. And this is really going to manifest itself in the end of games. Brown noted how much the lean on JJ Redick in crunch time, saying he gets "hammered" by defenders while illustrating his point by punching his empty palm. Butler's physical strength, on top of his skills and tools, just gives them a more versatile weapon to unleash in crunch-time. "It's a whole new gift I have, we have," Brown said about the impact of Butler's arrival on the offense. "The pick-and-rolls, I think some elbow isolations, pairing him up with Joel especially interests me...with the growth and inclusion of Jimmy, we're going to have way more available to us to walk down games." For all the discussion about fit and how the pieces will all fit together, there's also a basketball truism that's relevant here: talent finds a way. And to hear Butler and Simmons tell it, they just sensed an opening on the Butler inbounds layup that effectively iced the game. "His IQ is very high," Simmons said after the game. "He's the kind of guy where, the inbounds play where I threw it to him, that was going to happen before I even threw it, just because I looked at him. Some guys you can just look at and you already know what's going to happen before it happens." If Butler was simply a scorer and nothing else, he would still be a sight for sore eyes for this Sixers team. But it doesn't stop there, and though it came with some warts on Friday night, Butler plays with his head up and keeps the opportunity to playmake alive as defenses close around him. I know a ton of people are uncomfortable with the idea of the franchise center shooting threes — how dare they ask him to do anything other than stand by the paint! — but the Sixers are going to be able to generate open looks for Embiid from the perimeter that seem preposterous for a player of his skill level. If that video doesn't make it clear enough, I just want to show you a still image of the moment when Butler has a choice to try to score or distribute the ball. Utah is so hellbent on trying to stop him that three different players converge on him at the rim, clearing almost half the floor to close on him. The whole Butler experience is on display here. His quick reaction allows him to torch Joe Ingles (a good defender!) on the initial catch-and-go, he uses his footwork to separate from Jae Crowder, and as Gobert swarms in to force him into a decision at the last moment, Butler makes the right play to find Embiid open on the wing. Shots are not always going to drop, and the mid-air passes (as we have seen with Simmons) are not always going to find their target. But Butler feels things will grow with time, and some of his rare mistakes on Friday night will fade as time passes. "It's so different when you're out there with different guys, and you have to pay attention to who's out there and what their strengths are, so you know what to do," said Butler. "[On a turnover in the fourth quarter], it was my fault. I went into the paint and I went and told JJ my bad...that's part of the game." Offense for Butler as an individual was always going to come easy. So stepping in and being a productive member of the defense from game one has been excellent to see, and suggests it's only going to get better from here for the group. Butler's best trait as a person and a basketball player might just be his compete level. He fights through contact on screens, refuses to give up on plays, and is unafraid of the challenge of locking down someone else's top perimeter threat. Philadelphia does not necessarily rely on winning one-on-one matchups with as much as they switch these days, but it's nice demension to have. "He wants to stay on people like [Mitchell], he doesn’t really want to switch," said Brown. "You respect him, he wants that responsibility and so, trying to have him connected and learning some switch groups is going to be an evolution...but I thought he was really, really good on Donovan tonight." That might be an understatement. Mitchell got it going for a stretch late, but he was 13/35 from the field on Friday, thanks in large part to Butler's work. Rather than spotlight his work, though, I want to hone in on him sliding into the culture already in place in Philly. Butler made some postgame comments to Serena Winters about playing with guys who really want to win, and the public interpreted that as shade toward his former running mates in Minnesota. There's some truth to that, certainly, and anyone with a lick of common sense can tell the marriage wasn't meant to be between Butler and the Towns-Wiggins core. But if you look at this play in the fourth quarter, it looks like a group Butler was born to play with. 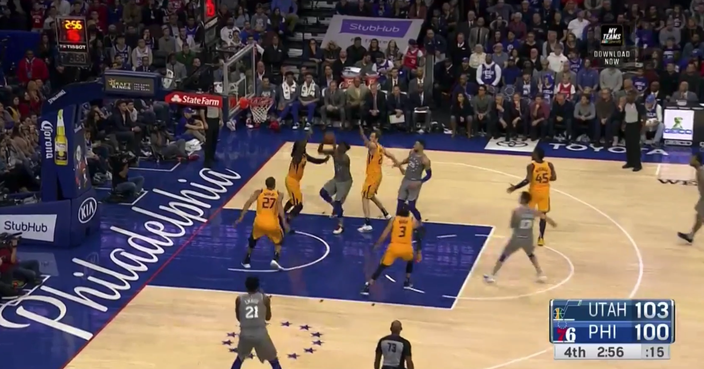 Embiid missing a free throw sets off a chain reaction — Mike Muscala crashes the glass, Embiid hunts down the ball to poke it away, Redick pulls off some sorcery to keep it in Philadelphia's possession, and then all Butler has to do is finish. The reaction from all parties afterward is telling — there are few better feelings in sports than creating a momentum play from nothing but pure effort. This all came, by the way, moments after Embiid finished a layup while being fouled by Gobert, springing to his feet to jaw with his opponent after getting one over on him. The fire is there throughout this group, and that's a starting point. There's a lot to figure out between now and the spring. 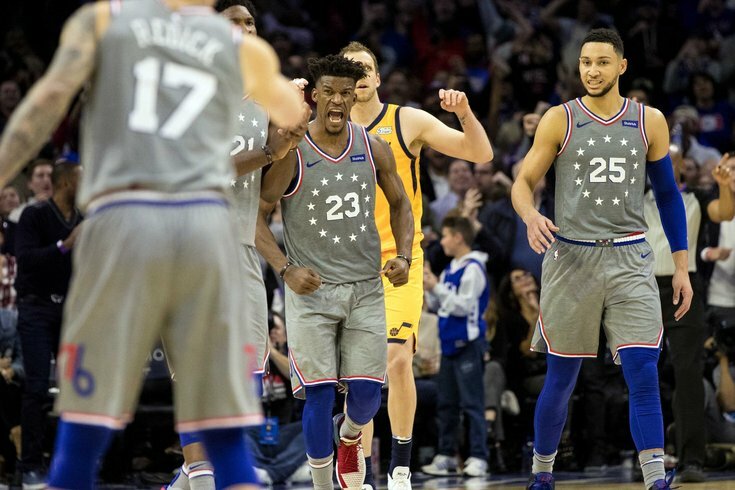 But there are a lot of competitors in the Sixers' locker room, and that will be enough to carry them as they build chemistry in preparation for a playoff run.